9" x 12" Silk Laminated Presentation Folders are printed on 16PT Extra Heavy Cardstock and are laminated with special material that gives the cards a very pleasant Silky texture. They are tear and water resistant. Best quality guarantee. 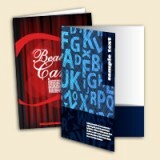 Compliment your presentation folders with Silk Laminated business cards.